This course is designed for language teachers from all educational levels & sectors, beginners and pre-intermediate as far as ICT skills are concerned. 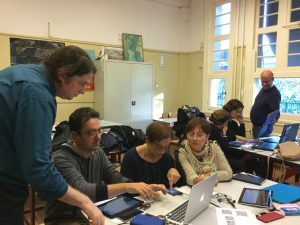 The course is to support language teachers in developing ICT skills for language teaching and learning and to give them the knowledge of Web 2.0 tools designed for educational settings. The course is created to equip the participants with hands-on experience in ICT and to demonstrate the potential of new media and the Internet use in the language classroom. It reinforces the participants’ digital competence and boosts their confidence as well as enhances teaching skills necessary to effective language teaching with ICT. • Writing – introducing Web 2.0 tools to motivate students to write and develop their writing skills. Discovering online applications for creative and collaborative writing. • Listening and reading – investigating Web 2.0 tools to develop students’ interests in mastering reading and listening skills. Various websites and online resources with texts, podcasts and recordings. • Speaking, vocabulary and games – researching online applications designed to develop students’ speaking competence and confidence as well as to give them tools to learn and revise lexis. A lot of games making learning and teaching language enjoyable. • Language teacher database – discovering and sharing numerous resources and ready-made recipes for your lessons. Plenty of materials to take home and use in your lessons. The course combines short introductions in the form of brief plenaries on the current methodological topics followed by presentations of related online applications, Web 2.0 tools, materials or activities. Then the practical work is done individually or in small groups depending on the needs and educational levels. Finally, the outcomes are shared and discussed.